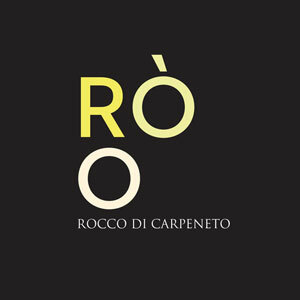 The arrival of the wines from Il Rocco di Carpeneto in Piedmont are certainly serendipitous. While teaching English in Rome, I would bore my students by telling them my hopes and dreams of becoming a wine importer someday and sharing my wonderful Italian experiences with the wine world in Boston. One such student was a woman named Letizia. Letizia worked in HR and always treated me like an employee of her company, trying to help me find the right path for my life in Italy and beyond. After hearing my story, Letizia told me about her sister Lidia and her husband Paolo, who had just purchased a winery in Piedmont. Lidia was finishing a master’s degree in winemaking and soon would begin her initial harvest. Lidia and Paolo also were working on creating an agriturismo, where they would be able to host tourists who were interested in experiencing life on their tiny winery. I was really intrigued and of course had to visit, so Kelsey and I planned a trip up to Piedmont and a stay at Lidia and Paolo’s agriturismo. From there, the rest is history. We tasted their initial batch of wines and were sold. We also saw the makings of a beautiful agriturismo (which officially opened in 2013) and in fact, were some of the first people to stay there. Lidia and Paolo lived and worked in Milan for about 20 years before giving up on city life and moving out into the country. Lidia has family land in Tuscany as well, where her father made some wine, which is clearly where Lidia got the itch and the knack for winemaking. Tasting her first batch of wine was truly amazing, as you could sense she was really born for this work. Lidia was very successful in her past life, and is extremely thorough by nature. Numbers are her thing. Thus the transition to analyzing her vines, soil and wines was second nature. Keeping a keen eye on this is crucial when making natural wines. 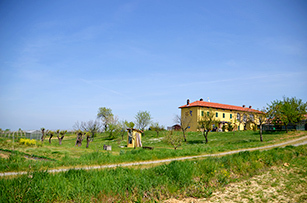 Lidia and Paolo produce natural wines that undergo spontaneous fermentation. The wines are unfiltered and see only the slightest addition of sulfites. In total, Lidia and Paolo have about 5 hectares planted to vine. They produce Dolcetto and Barbera as if they were Nebbiolo. The yields are around 45 tons per hectare, yields that you would normally see in Barolo or Barberesco, and rarely with the under appreciated Dolcetto grape. This special treatment makes sense, as Ovada, the DOCG in which these wines are produced, is the birthplace of Dolcetto. 2013 saw the first substantial bottling for Il Rocco, but by substantial I mean a hundreds! They’ve started with two Dolcetto’s, Losna and Steira, the latter of which will be a cru wine of sorts from their oldest vines. Lidia and Paolo went through an exhaustive search in selecting their vineyard site. Their vision was to find a vineyard in a wine region that was being “misrepresented”. Ovada was the perfect location, the birthplace of Dolcetto that was largely dominated by cooperative winemakers making table wine out of a grape with such potential! Their second criteria was the existence of older vines, crucial to their goal of making natural wines with finesse and structure. They came across these 5 hectares in Carpeneto, with many vines of Barbera and of course Dolcetto that had been planted over fifty years ago! Since settling on this site in 2009, they immediately converted the vineyard to organic farming. The vineyards are split up by both varietal and by age of the vine. 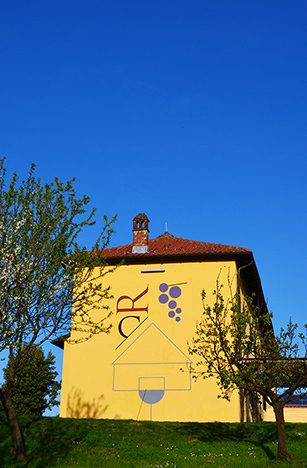 For example, the “Rocco” vineyard includes Barbera planted in 1955 and Dolcetto planted in 1970. These older vines are not the sole focus of the plantings, as there are some younger Dolcetto, Barbera, and Cortese plantings, as well as newly planted Nebbiolo and Albarossa. Paolo and Lidia are very progressive in a lot of what they do in the vineyard, but are also willing to follow old traditions. The planting of fava beans in between rows is one of those more traditional techniques, creating a natural ecosystem and applying just the right amount of stress on the vine to produce the ideal fruit. In terms of being progressive, Paolo and Lidia entrusted the local university laboratory to select where to plant their Nebbiolo. All soils are mostly clay loam, and vineyards have an even exposure. From the vineyard to the cellar, the organic/natural theme continues. 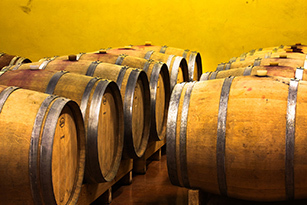 All wines are spontaneously fermented in stainless still (except the Steira) with indigenous yeast. Wines will eventually make the way to the cellar, a combination of Slovenian and French oak (mostly older) as well as terracotta from Georgia. 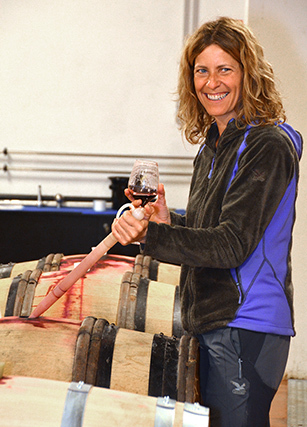 Wines are constantly moved from larger barrel to smaller barrel, newer to older, French to Slovenian, as Lidia attempts to get just the right balance. The walls of the cellar are lines\d with stone from a nearby river basin, helping create ideal temperature and airflow. Surprisingly for such a tiny winery, Rocco even bottles and labels themselves in order to have complete control of this delicate process. Everything is done with the idea of creating the most natural and expressive wine possible, and the proof is in the bottle! A Cortese grown just West of Gavi (across the river), thus it cannot be called so. A funky white with a nose that keeps you guessing, but with pronounced notes of lemon and white peach. A great balance is struck here between balance and freshness. This wine certainly doesn’t lack some meatiness to go with fantastic minerality. Almost tropical fruits appear on the finish with a hint of nuttiness. Drink this a little warmer and let the aromas fly!..Roo in local dialect means the halo of the moon. Cortese traditionally get paired with fish and even pesto, as the grape is grown quite close to Liguria. I wouldn’t be afraid to pair this with flavorful pasta dishes, shellfish and white fish. Grapes are manually harvested, spontaneous fermentation with a brief maceration on the skins upwards of a half day to give texture and color. 1/3 of the wine will age in accacia oak barrels, with the other 2/3 in stainless steel. 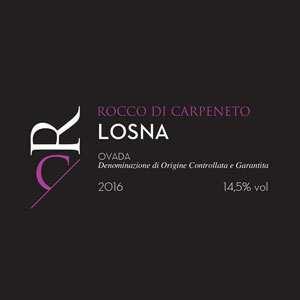 In 2013 (the first year of production of this wine) Rocco used new oak barrels, so the 1/3 of the wine in oak was rotated more frequently than normal. In theory, the portion in oak will spend 4/5 months. 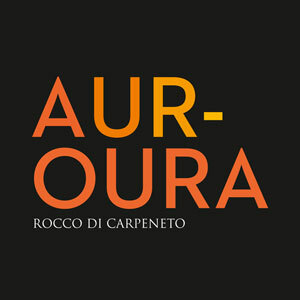 The only dolcetto from the group to avoid oak, Aur-Oura is a welcome edition to the Rocco di Carpeneto family of wines. Seeing only cement and stainless steel this wine offers a mix of what one generally expects from the varietal, as in a lighter style, and the strong sense of terroir in all of these wines. Hearty pasta, tomato based soup, grilled meats. Hand harvest, natural fermentation, 12 months in stainless steel. Unfiltered with under 50 mg/L of sulfur. 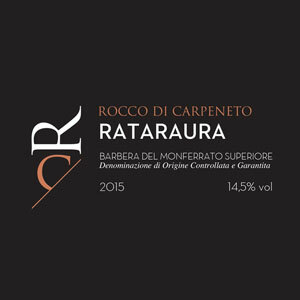 This is a brother to their other Barbera Superiore, with one main difference, an additional 6 months in amphorae. The idea was to experiment with aging in terracota, and the result was quite interesting. The clay seemed to soften the intense and raw acidity prevalent in their other Barbera, and makes this version more approachable. Familiar notes of Barbera, dark fruits, spice, but with a much livelier mouth feel. Perhaps the best pairing experience was filled tortellini in a broth of the wine itself! Think richer meats with such strong acid to cut through the fat. Bold flavors, perhaps beef with fig to match the intense flavors of the wine. Harvested from their Gagerro and Vicario vineyards, planted primarily in the 1970s, this production is predicated off of old vines and natural wine making. Maceration of 2-3 weeks while fermenting with native yeast. The wine then spends the next 20 months between French and Slovenian oak as well as the terracota. Very minimal sulfites used as to not mute the flavors or aromas. A dolcetto of great structure and elegance. Bright notes of mature dried red fruits like cranberry and cherry. Notes of balsamic and cinnamon. Full bodied with big tannins that are nicely integrated into the wine. A slightly bitter but lasting finish. This is Piedmont in a bottle; a big, dry chewy wine that will certainly make you rethink your stance on Dolcetto. Truffles! Works well with truffle risottos, lasagna and hearty pasta, pizza and grilled meats. Grapes are manually harvested, spontaneous fermentation with a maceration of 2-3 weeks. 12 months aging in French oak barrels, usually second passage oak. A little bit bigger than the Losna and coming from denser, richer fruit from their “cru” site. These vines have a story to tell, and it is one that will surprise you. Red fruits like cherry and raspberry marry darker fruits like blackberry and prune. Very well rounded wine with great acidity, which nicely balances the fruit. Grapes are manually harvested, spontaneous fermentation with a maceration of 2-3 weeks. 15 months minimum aging in French oak barrels, usually second passage oak. Stay at Rocco di Carpeneto’s stunning B&B. La Bella Vite is located amongst RdC’s vineyards and includes rooms in modern tree houses!! !